Played some Airborne Ranger yesterday. Also been quite enjoying Shadows of Sergoth, too. Chase HQ: Haven't given this one a proper play in weeks. Made it to level 5 on three credits. I think I've only ever made it to the final level once, and that was when I was 13 years old back in 1989. I'm not sure I have the dexterity to play up to accelerate games like I used to have anymore, tbh. Manic Miner: I got pretty far on this last year, but I've lost my technique since. I'm lucky if I can get past The Endorian Forest these days! I was surprised that I now do better in most of the cases. I'm still okay at a lot of games, I just can't stand racers which require up to accelerate anymore. It's bloody painful.  Would be better if a redefinable option for the stick was available. Always the GX4000 hack though if I play it on my 6128+. Been trying not to get lost playing The Eidolon today. Did end up finishing it with no deaths, though. The last couple of days it's been Mission Genocide... I recorded some footage too, but am [ahem] a little out of practise. Loved this game from Paul "Spindizzy" Shirley, in particularly its super soft hardware-scroll. Spent far too much time to be healthy today playing Ninja Scooter Simulator. Same developers (Probe Software). Only they they made Ninja Scooter Simulator faster, more controllable, and shoved the difficulty way too far up the easy side. I thought it had a feel to Metrocross to it when I saw it on a stream the other day! I assume there is a tehcnical reason for the low number of colours used. Maybe to gain processortime? Have been playing far too little for far too long. Today I wanted to play The Very Cruz Affair though. That's a game I've kinda been saving ever since I saw a cracktro for it back in the 80s. But I couldn't get it running on my CPC plus machine. So today I loaded it on my CPC464, but after the first screen it didn't work. Does anyone have any info on this? A patched version? Does it require a CPC6128? What? This thread explains the technique. In short, it is a lot faster to use this technique than to use the full palette of 16 colurs. I remember playing only on my 6128 - I don't think there's a tape version, so maybe it's 6128-only? Used to love it, very original game! Since it was the first Amstrad game I bought back somewhere around 1985, I played some of The Survivor (and kinda failed). 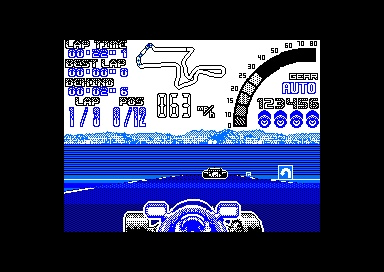 I was thinking of finally playing Nigel Mansell’s World Championship from Gremlin. But then I noticed there’s two versions, a 64k and 128k version. The 64k version is on s CDT file, so no way of loading it on s real CPC at present. My question is, does the 64k version run smoother as it appears to have reduced graphics? Playing Switchblade CPC old this week. Love this game, just for the superb Ingame music. One of my all time fave games. "4 MHz ought to be enough for anybody." It sure is possible to use a CDT on a real CPC. I myself use a homemade TZXduino clone for that purpose. It's kind of a Gotek drive, but for tape files (hence CDT files). Played some Jack The Nipper last night. I'm sure I could do better with a bit more practice. Page created in 0.282 seconds with 105 queries.